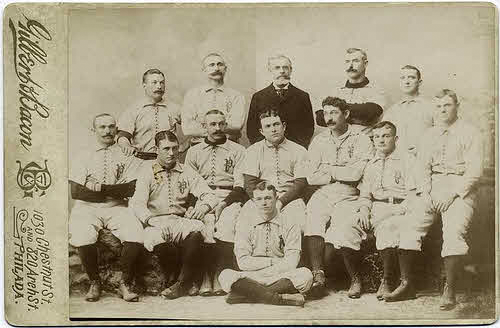 The 1891 Phillies. Charlie Reilly (first row, second from the left) and Sam Thompson (next to Reilly, third from the left) were two baseball players who also appeared on the Phillies ALPF pro soccer team three years later. The first two professional soccer leagues ever formed outside the British Isles both opened their doors in the United States in the fall of 1894. The first, by a week, was the American Association of Professional Football Clubs, but it had been formed in reaction to the other, some might say in imitation of it. The other, which had stronger financial backing and had been anticipated by fans for some months, was the American League of Professional Football Clubs. In the end, however, it proved no more successful than its rival, and perhaps less so. It began play in several northeastern United States cities on Oct. 6, 1894 and closed only 17 days later. If it accomplished anything, it was to provide those who would follow in its path with a manual on what not to do. The ALPFC had teams in six cities: Boston, New York, Brooklyn, Philadelphia, Baltimore and Washington. All of them were owned by professional baseball clubs, a common failing among American pro soccer teams over the years, and their primary objective had little to do with promoting the sport of soccer. It was to enable those baseball clubs to make use of their stadiums during the off-season in a way that would be more profitable than sitting empty (in other words, not as unprofitable). Of all the mistakes that the ALPFC made, perhaps the worst had to do with scheduling. It had a product—soccer games—that in 1894 America appealed particularly to foreign-born factory workers. So it scheduled most of its games for weekday afternoons, when those workers couldn’t attend. This error can be largely attributed to the fact that most of the leaders of the league were baseball men, who seem to have concluded that since baseball was played on weekday afternoons, soccer should be also. A spectacularly dumb decision, but not a surprising one considering that those owners were people who felt that putting baseball players on the teams and having baseball managers do the coaching was something that would make the teams better. The league damaged its reputation a bit more, and drew the unwanted attention of federal immigration authorities, when the Baltimore club smuggled in some English professional players from Manchester City and Sheffield United. They claimed that these players, whose skill put the rest of the league to shame, had their distinctly non-Baltimorean accents because they were from Detroit, a ruse so ridiculous that it makes the entire business sound somewhat like a Marx Brothers movie. It seems appropriate that since the reason for the league’s existence in the first place had to do with baseball, the reason for its sudden demise should also. Of course, low attendance had a lot to do with it, but the main reason was that the team owners began to hear rumblings about the organizing of a rival baseball league (at the time, the National League was the sole major baseball league). They decided that if they were going to be challenged in this way, they had better circle the wagons and eliminate any risky frills in their operations. Soccer teams were the very epitome of a risky frill. So, on Oct. 20, 1894, the American League of Professional Football Clubs expired. Fortunately, American soccer did not. A version of this article was originally posted on the Big Soccer.com website in July 2011. It is a combined – and very much condensed – version of accounts of the ALPFC by Steve Holroyd on the American Soccer History Archives website, by David Wangerin in his 2006 book Soccer in a Football World and by Sam Foulds and Paul Harris in their 1979 book America’s Soccer Heritage.